Whether you are a first-year teacher, a military spouse who’s always on the move, or a veteran teacher switching districts, there are times when it’s necessary to be a new teacher in a building. Here are some tips for new teachers that I’ve learned after five years of teaching in as many schools. Through my undergrad and graduate work, I had three different teaching internships: each a semester. 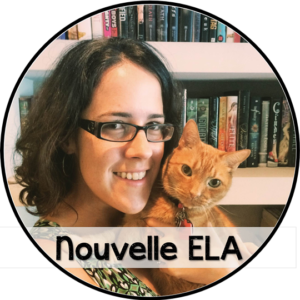 I worked for a year teaching English in France, and split my time between four different schools. I’ve also worked in Germany, Puerto Rico, and North Carolina. Now that I’m a military spouse, I know that I have even more moves ahead of me. I’ve had to figure out how to hit the ground running, make friends, and find the support I need in the building very quickly. As a new teacher, you’ll have a lot of names to learn, but sometimes you’ll only get to hear someone’s name once before you’re expected to know it. During my school tour, I carry around a little notepad and write notes surreptitiously – Maggie, Registrar, cute earrings! – and then study them in the evening. I also retrace my steps the following day and try to say hi to as many people as possible, using their names. If I mess up at this point, they’ll correct me… better that than not knowing their names two months in! It can be difficult to make friends as a new teacher in a school. I’m an introvert, and so it’s not my inclination to strike up conversations with people. Still, friends are important to your well-being, and it’s even more beneficial if you can find like-minded people to spend time with. Go where you want to hang out. I mean it. Are you an extrovert who enjoys telling elaborate stories for an audience? Perhaps the teacher’s lounge is the right place for you to find friends. Are you someone who likes to relax during your lunch time? Look around and see if any of the teachers in your school hide away and watch Netflix for their 20-minute break. I like to leave at 3:30 or whenever my contract time is finished, but I’m a morning person. I scouted out some teachers who would arrive for a cup of coffee together in the back of the library before school, and those are the people I click with most. I learned to ask questions the hard way. At my last job, the principal gave me a huge manual about how to be a new teacher in the school, and I thought that was it. I was wrong. It turns out that every school has traditions, procedures, and a culture that many teachers will assume is obvious. If you want to blend in as the new teacher, assume nothing and ask very thorough questions. Here’s an example. Let’s say that Friday approacheth and the student athletes are getting jittery. Perhaps there’s a pep rally that no one told you about (“Oh, we have Pep Rallies on the last Friday of every month – no one told you?”). What time does the Pep Rally start? Is there a special schedule for classes? How do we dismiss students after the Pep Rally? How does supervision during the Pep Rally work? Should I stay with my grade level, or roam? Are there props or costumes I need to bring? Are students allowed to do anything else besides attend the Pep Rally? What are bathroom procedures during the Pep Rally? As you may have surmised, I did have an embarrassing faculty tradition moment once at a Pep Rally, and I just wish I would have asked about it in advance. It’s often difficult for a new teacher to keep a positive attitude, but it’s so important. Your friends are going to help you, and your dogged preparedness will certainly help, but things will inevitably pop up. Also, you’ll hear veteran teachers of the school complain, and you’ll think that you should play along. Veteran teachers complain about a school in the same way that siblings complain about each other or parents tease their children. You are the stranger, and you just don’t have the same privileges. Stay positive, be a good listener, and keep the negative thoughts for your reflective journal. 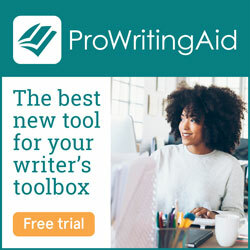 That being said, if you have a real struggle, you need to write it down and present it to a person who can help you. Try to identify a first line of attack before your principal, since s/he is very busy. Once you identify this person, don’t talk to everyone else about it, no matter how good commiseration may feel. Schools are small places, and a community can turn on a new member quickly. That’s it for me. 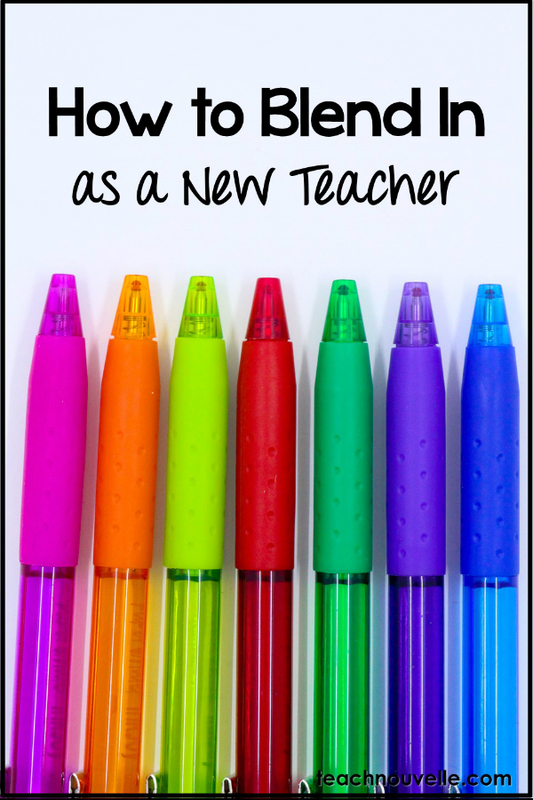 These are my top four tips for being a new teacher in a school. 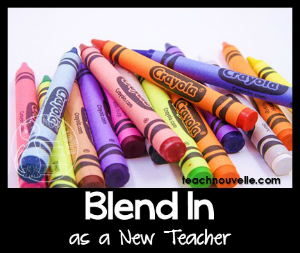 Good advice, but I’m not sure “blending in” should necessarily be the goal of a new teacher… Maybe “How to Find Your Place as a New Teacher” or “How to Acclimate to a New School”? Just some food for thought! Oooooo, I like where your head’s at, Miss Upah. 😉 I feel like we could have a long, philosophical conversation about this! I do believe that reading school culture quickly is very important, but maybe “blending in” has a hint of mediocrity and complacency in it? Definitely interesting to think about – I certainly don’t want to suggest that teachers should lose what makes them unique! Thanks so much for this. Yes, this is just what I was thinking. We’re on similar pages! It just caught me off guard when I saw your graphic about blending in. Thanks for your response! Love your blog!